Today, Fishergate is a quiet street on the outskirts of the city centre, just to the west of Magdalen Street. Standing outside St Edmund, it is hard to conceive what the setting was like a century ago. 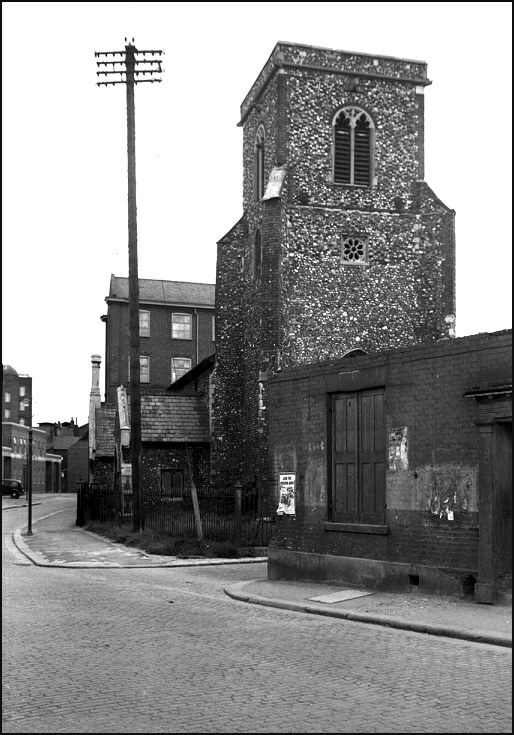 Where low-rise social housing and warehouses spread was then the heartland of industrial Norwich, enormous dark factories dwarfing this little church. A small building with a south aisle hidden from the street, the church can never have had any of the grandeur of some of its city neighbours. St Edmund is the patron saint of East Anglia of course, and the dedication suggests an Anglo-Saxon foundation, but the church we see today has nothing about it older than the 15th Century, when it was completely rebuilt. However, the cottaged streets and small workshops it once served were swept away by the Industrial Revolution, which planted the great shoe and hosiery factories in this parish. Inevitably, as its parish population declined, St Edmund fell into disuse before the end of the 19th Century, being only a few hundred metres from St Martin at Palace, St James and St Saviour. It quickly decayed, the roof only being repaired to make it watertight for use as a factory store. Ironically, the rest of the structure was in good condition, because the church had been largely Victorianised not long before the end of its liturgical life by the enthusiastic Edward Boardman in the 1880s. Boardman's is the vestry with its chimney, the roof and the top of the tower. One night in January 1913, Norwich was lit up by a massive fire when the factory that surrounded the church on three sides went up in flames. After that, the area became a wasteland, but some attempt seems to have been made to rescue St Edmund. 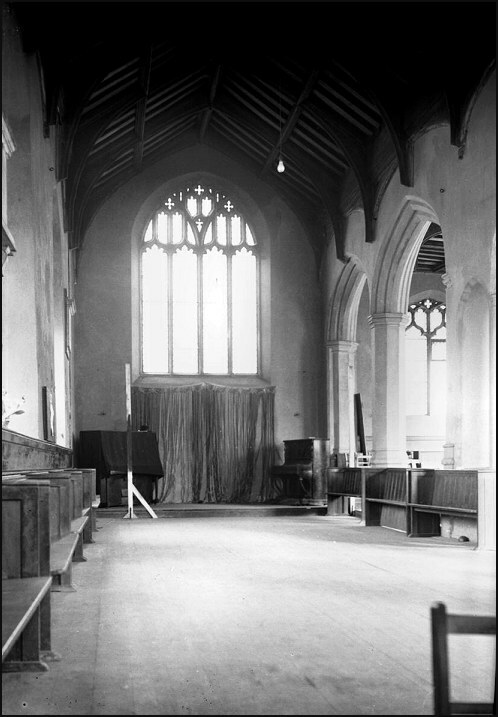 When George Plunkett came this way in 1938 and took the three photographs below, he found the building in fairly good condition. 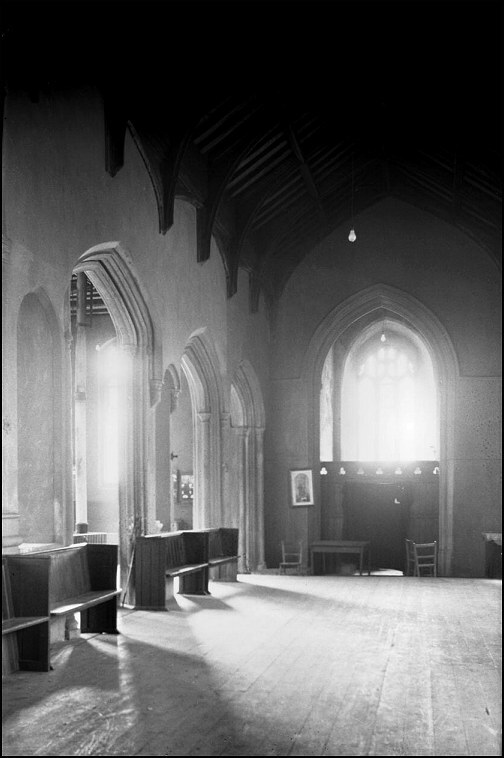 The interior had been cleared except for some benches facing inward, suggesting that it was in use as a hall of some kind, perhaps for the nearby churches of St James and St Saviour. St Edmund suffered damage in the War, and when Cautley visited in 1946 he was unable to get inside. For years after that, the dereliction spiralled, until the church was little more than a shell. 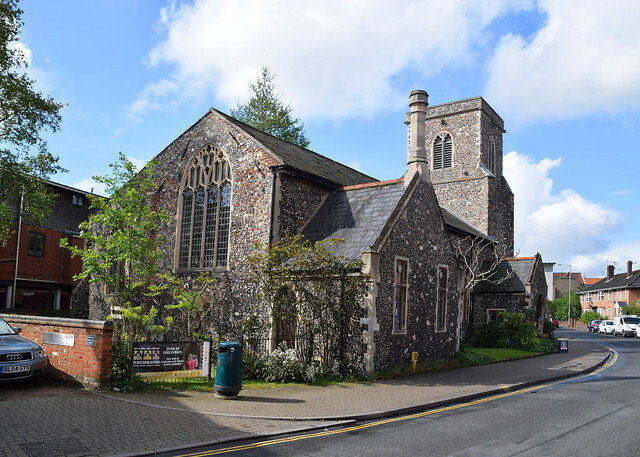 However, St Edmund is one of the few churches that can be truly said to have benefited from the Brooke Report of the late 1960s, which resulted in large numbers of the Norwich city centre churches being declared redundant and threatened with demolition. 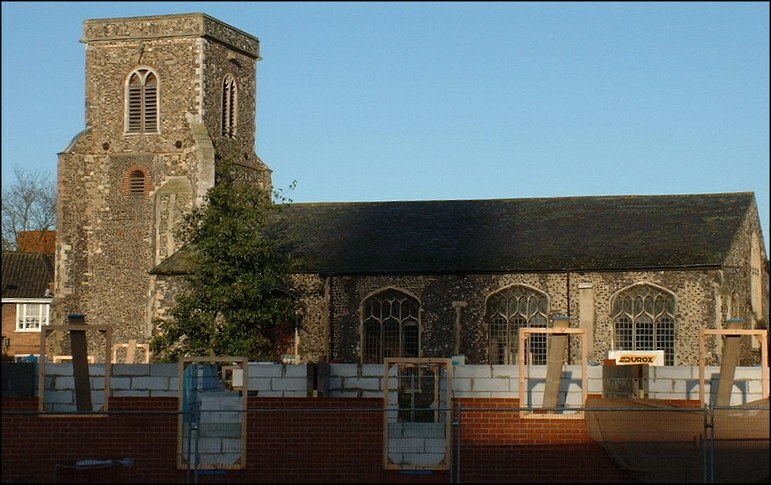 The appalled reaction resulted in a renewed interest in caring, and finding new uses, for Norwich's redundant churches, and this led to its repair and renovation by the Norfolk Churches Trust. After a period of use as a store for the nearby Norwich Puppet Theatre in St James, it was let to Norwich Community Church, who rebadged it as the Fishergate Centre. When they moved out to larger premises, the lease was transferred to Norwich Pregnancy Crisis for use as an advice and counselling centre, keeping its new name. 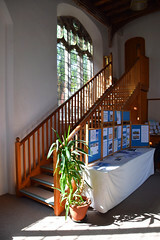 The interior was reordered appropriately with stairways and partitions put in place to make it suitable for its new use. 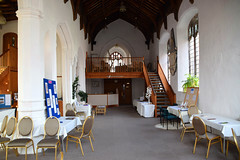 Today, it is the Fishergate House of Prayer, in the care of an ecumenical organisation called Call To Prayer, part of the Ffald-y-Brenin Local Houses of Prayer movement, who describe their mission as enabling, encouraging and facilitating prayer. The building is mindful of its heritage. Before Boardman got its hands on it, St Edmund had a perfectly serviceable Georgian interior, perhaps like a small version of St George Colegate. Nothing at all survives of either the Georgian or Victorian furnishings, but this allows a clear view of an extraordinary arcade, with open squint-like niches in between the arches. I wonder what they were for? 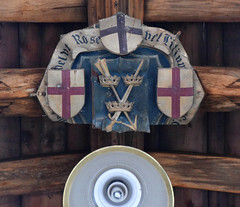 The one great medieval survival of the church is the remaining part of a boss, halfway along the nave roof, which depicts the arms of St Edmund flanked by those of St George and the cathedral priory. You can see it at the top of this page. The lower part of the boss is lost, but the upper part is surrounded by a repainted banner which originally read Velut Rosa, Vel Lilium, 'like a rose or a lily'. 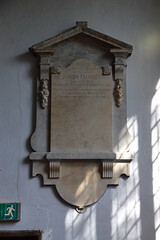 The lost part of the inscription would have declared that the church's patron saint was Flos Martirum, 'flower of martyrs', the circular inscription making sense in any order. 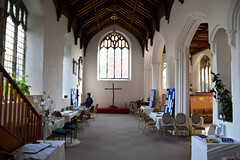 The aisle is organised into quiet spaces, the continuous nave and chancel leading to a large, simple wooden cross set on a raised platform. The stairway and west gallery at the other end are simple and do not intrude. 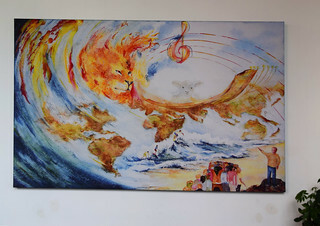 All in all, it is a lovely, prayerful space. St Edmund is an adornment to its street and a useful spiritual enterprise for the people of Norwich. If it is less well-known than many of the Norwich medieval churches, this is largely as a result of it being so hemmed in and cut off from the city centre. However, in 2001, a view not seen in more than a century was opened up when the factory and warehouses to the south of the church were demolished. They were quickly replaced by a housing scheme, but not before Chris Harrison snapped the view you see on the right. Take a good look, because you won't see it like that again in your lifetime.